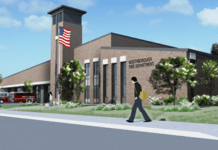 Northborough – Community Preservation Committee (CPC) Chair John Campbell presented six articles for the April Town Meeting Warrant to the Board of Selectmen at their March 13 meeting. The CPC has approved these articles, totaling $545,900. Campbell informed the board that there are three projects pertaining to open space that include $30,000 for work to be done by the Conversation Commission on Bartlett Pond and another $30,000 for the Trails Committee for ongoing trail maintenance, signs and kiosk purchases. The last open space article is for a $45,900 debt service payment for the completion of the acquisition of the Green Street parcel which has been developed with trails and is “terrific for hiking,” according to Campbell. An article for $100,000 for the Northborough Affordable Housing Corporation (NAHC) allows for the creation of additional stock. This year they are partnering with Habitat for Humanity on a project located at 33 – 39 Main St. He noted that the project is well under way. The largest appropriation article from the CPC is for Phase II of the Town Common project. The appropriation is for $377,400 which will be offset by a $215,000 Parks Initiative grant recently received. Final articles will allow for the first debt service payment for White Cliffs and an article for CPC administrative expenses. Selectman Leslie Rutan asked for a brief summation of the CPC’s accounts and Campbell replied that there is presently over $800,000 in unreserved funds and a conservation account in excess of $800,000. The CPC’s revenue each year is over $500,000, of which, a portion is matched by the state.